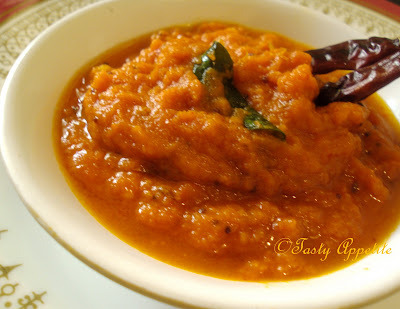 Today’s post is spicy hot Milagai Chutney, a treat for people who want something real fiery for tastebuds..!!! This is extremely easy to prepare and the dish reminds you of the rich spicyness of Indian cuisine. You will love the intense red color of this milagai chutney and it makes a perfect companion for idlis ( South Indian steames rice cakes ) & crisp dosas. Also we can use them as dips or as accompaniment to a meal. Add red chillies & chopped tomatoes to mixer and grind for a minute. Add shallots and garlic and grind further. Add mustard, cumin, split urad dal, curry leaves and asafetida. Now add the ground chutney, salt and sauté in medium flame. No need to add water, continue sauting for 10 to 12 minutes till oil separates. 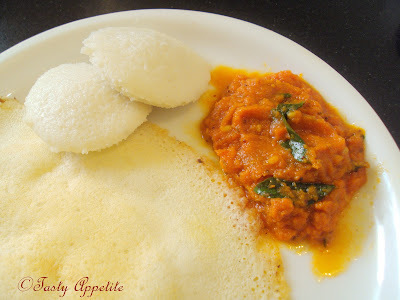 Serve it with hot soft idlis and golden crisp dosas. Hot N spicy milagai chutney ready to taste. Chutney n idly! Looks lovely, Im here in Bryce canyon, Utah, for long weekend .... Just glad to find something veg! Your blog makes my mouth water! Glad u liked my site! This sound like a perfect way to warm up on the inside on these cool fall days! Such a pretty color! Thanks for inviting me by. Love your chutney recipe. 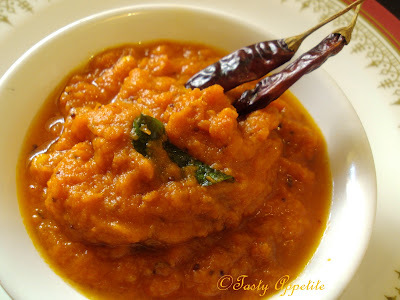 I have to agree with you that this lovely chutney will be a perfect pairing with tosai all the more we love fiery and spicy taste so much. Chutney looks very spicy and delicious...mouthwatering!!! I love the fresh, bright, friendly look of your blog and the beautiful and yummy photos. I'm now your follower as well, and I'm glad to have found your site. Lots of great stuff here. I joined your feed as well so I'll be notified when you post again. Thanks for the comment! I'm excited to take a look around your blog- I like what I see already!! Thanks for stopping by...I really appreciate the time n effort taken in giving your feedback..
lovely chutney! its been a while since i made a hot chutney... goes so perfectly with everything!. thanks for sharing! I love the color of this chutney! I'm such a chutney person, especially spicy ones like this. YUM! Looks spicy and yummy ...u have got such a perfect weekend platter ! Hi, thanks for visit me, and live your comment. I love your blog, so i stay here to follow your lovely, spicy recipes. I'm sure this is very tasty with any meal bravo Jay! thanks for visiting my blog and Thank you for this invite. I'm glad I found yours, I can almost smell the flavors of this lovely chutney. I adore south-indian cuisine, I will be in Kochin again coming february and looking forward to it very much! this looks very spicy but delicious! wish to try some! Thanks for stopping by our blog and for following! I am now following you back! You have a great collection of recipes here and I look forward to trying some of them! I think this lovely looking recipe is too spicy for me. I'm looking for something more creamy and with less heat. Can you recommend something? This looks delicious! I'm not a huge fan of spicy food, but I'd totally try this as a dip. Hola guapetona, aquí estoy devolviéndote la visita, gracias a tu comentario he podido conocer tu blog. Delicioso plato, me guardas un poquito??? Besitos y encantada de haberte conocido, nos vemos por aquí. Me gusta tu cocina, asi que me quedo por aqui con tus recetas, son todas estupendas. I love this one, so spicy and colorful. Simply finger licking. 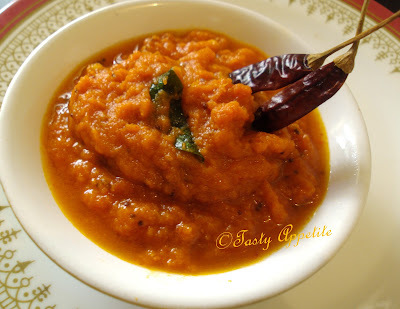 Red Hot Chutney recipe is a most popular recipe and very spicy. Here i found healthy homemade Chutney recipes and preparation process is very easily.